With the sound of change as Beverly Hills looks back on a star-studded century. How will the world’s most famous residential brand reinvent itself for the next 100? 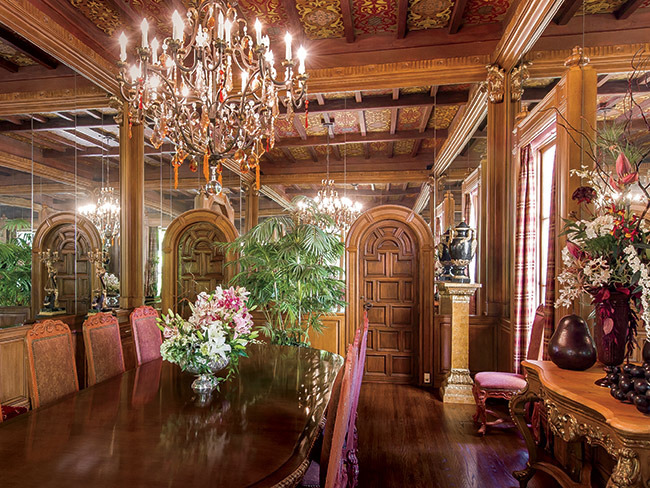 Baroque and mirrors: A Spanish Revival-style Roxbury Drive estate, built in 1926 and listed for $23.5 million, is a rare remaining example of historic Beverly Hills real estate. It’s hard to believe that Beverly Hills was once a rancho of lima bean fields and chaparral-covered grazing lands, where land cost just $400 per acre. Later master-planned as a city beautiful by architects Myron Hunt and Wilbur David Cook—the broad, tree-lined, curving streets and greenbelts are the most visible reminder of their design—it’s clear that LA’s most recognizable neighborhood has come a long way in its first 100 years. But that fame has come with a price, as the enclave’s classic homes currently face redevelopment pressures (and even extinction), a direct result of the city’s exclusivity, soaring property values, and manicured environs. Today’s hankering for massive contemporary mansions conflicts mightily with Beverly Hills’ charming mix of architecture from earlier eras. The city’s older stock of Spanish-style, Art Deco, Midcentury Modern, and Hollywood Regency showplaces—many by master architects—are often deemed out of date and undesirable by buyers who crave tech-ready houses, open floor plans, and sizeable kitchens and baths. Although a new historic preservation ordinance is intended to stem the demolition of culturally significant and historic homes and preserve landmarked exteriors, many of the city’s most famed estates, like its grande dames, have already gone under the knife and are no longer recognizable. “We lost many great homes,” admits Rodeo Realty’s Josh Flagg. He believes the city’s new preservation ordinance is a good thing, but “it came a little too late. It would have been better 15 or 20 years ago.” Notable losses include the preeminent estate Pickfair, famously built in 1919 by charter residents Mary Pickford and Douglas Fairbanks, razed and replaced in 1981; the Shusett House designed by John Lautner, which was leveled in 2010 despite preservationists’ lastditch efforts; and more recently, lyricist and composer Ira Gershwin’s North Roxbury Drive home—notable for its Hollywood Regency style and its central role in the city’s midcentury social life—was bulldozed into rubble. “Everyone wishes they’d done it sooner,” agrees Hilton & Hyland’s Jeff Hyland of the preservation ordinance, which was put into place almost three years ago. Before it took effect, “It was easier to tear down a building than to get a dog license,” says Maralee Beck, chairperson of the city’s Cultural Heritage Commission. And she’s not joking. Previously, demolition could begin within days, with no reverence for the architect, the home’s past history, or its cultural significance. An imminent threat to a prized Richard Neutra–designed manse above Sunset Boulevard instigated the ordinance’s passing. “There’s a beauty to the city, and if we’re not careful about the way we steward these resources, we won’t have them,” she asserts. A 1926-built Italian villa is considered one of the last stalwart survivors of Beverly Hills’ golden age of real estate—when architecturally significant mansions were de rigeur. $24.995 million buys 1.24 acres of land, an Art Deco interior with light fixtures from a 16th-century Venetian castle, and a mosaic tile-lined pool and spa. Beverly Hills’ most prized historic aspects are its remaining grand estates, many hidden from view behind high hedges and gates and accessed by long drives. “Richard Branson has been quoted as saying, ‘privacy is the most sought-after commodity,’” notes Coldwell Banker’s Joyce Rey. “Anyone with a degree of privacy due to their real estate is in a good place.” Rey recently represented a $25.5 million Paul Williams compound with celeb provenance—built for Bert Lahr, The Wizard of Oz’s Cowardly Lion, it has also been home to such notables as Paul McCartney and Melanie Griffith. Ralph Lauren redid the interiors in a Hampton-esque style, although some original details, such as a mahogany-paneled bowling alley, remain. Hyland and Jade Mills, Coldwell Banker Previews International estate director, Beverly Hills, share a similar historic listing for a Roxbury Drive Spanish Revival–style estate (listed for $23.5 million) built in 1926—one that now has all the contemporary must-haves, including a digital media room to complement its vintage exterior and old-world finishes (stenciled and beamed ceilings, carved limestone fireplaces). The grand, vaulted foyer of this $23.5 million Roxbury Drive estate leads into an equally grand living room with beamed ceilings, a limestone fireplace, and five sets of French doors that overlook an expansive courtyard. “No matter where you travel in the world, people know about Beverly Hills,” says Mills. She bought her first house in the early 1970s, when properties in the flats were selling for between $150,000 and $250,000 (the national median home price was approximately $32,500). 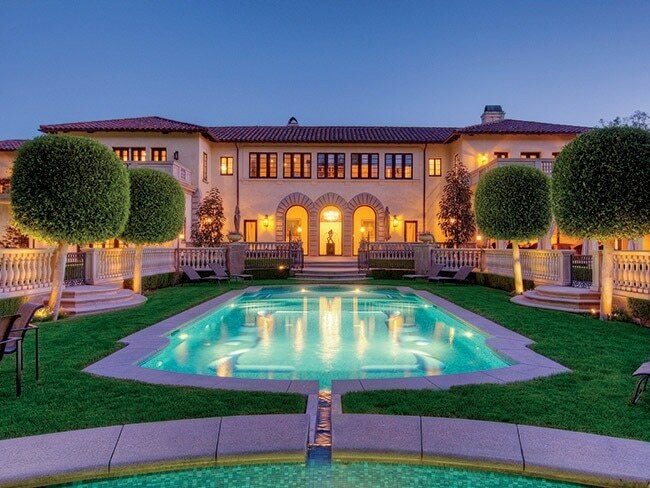 A Chamber of Commerce member, Mills believes, “It’s really important for the city to keep the feeling of the old Beverly Hills.” She recently represented a classic 1926-built Italian villa (listed at $24.995 million) that epitomizes the city’s golden era. 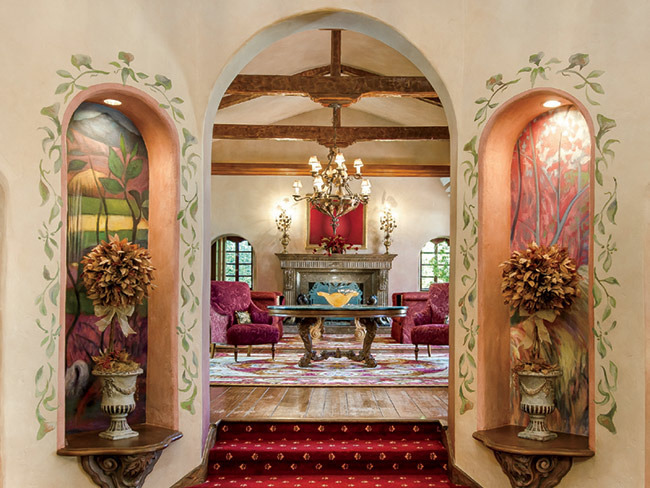 Set on lush gated grounds, the myriad interior details include hand-cut wood floors, an Art Deco tearoom, and a solarium reminiscent of one in the Doheny mansion.